Jesse Marsh is an international consultant that has already worked on more than 35 EU Projects, involving organisations like for example the “Club of Rome”. He is specialised in local development, strategic planning and innovation. He started his career in the United States where he finished his Bachelor of Arts. Later on he moved to Italy and began to work as an industrial designer and consultant. Moreover, he is an award-winning speaker, who has already participated at several conferences all over the world. In his speech he is going to show us an innovative concept that could totally change our current idea of energy consumption and usage. He will discuss the possibility of designing a community and government structure, where energy is considered as a common good and how this different system might foster social innovation. Jana Revedin is a successful architect and holds the Professorship of Architecture and Design at Blekinge Institute of Technology in Sweden. Born in Constance, Germany she was first trained as a cabinetmaker. Later, she studied architecture and urban planning in Buenos Aires and Milan. In 1996 she founded her own architectural practice, which specializes in sustainable architecture and urban renewal. She has been guest professor at Milan Polytechnic, Federico II University Naples and Umea University and is the author of numerous publications on contemporary architectural theory. Moreover, she is a required key speaker at Symposiums on Sustainable Development, Participative Cross-disciplinary Processes and Interactive Pedagogy. She lectures in German, English, French, Italian and Spanish. At her TEDxKlagenfurt speech “Empowerment by Design: zero-energy-lights for Cairo´s slums” she will show us an example on how sustainable living environments can be successfully implemented and how much creativity is released through measures like Energy-zero-design and recycling. Dietmar Stuck has many years of experience as a well builder and has worked on projects in Africa, Australia and Europe. Years ago, he decided to specialise in sustainable development and invented the “NSP-new solar pump”, which is a solar water pump that needs no complicated maintenance and no external energy connection. The “NSP-new solar pump” supplies drinking water for people in the third world and saves 1000 lives per day. Dietmar Stuck has already won several prices and awards for his innovative and sustainable ideas. Florian Brody is an international marketing and digital media specialist with more than 20 years of experience in his field of business. He has been working as an adviser for a huge number of known companies in a wide range of industries. Moreover, he has co-founded several start-ups and has acquired a reputation as an internationally acclaimed speaker. Brody co-invented the first electronic books and built the multi-media market for Apple Austria. Furthermore, he teaches courses in digital media, entrepreneurship and mobile payment strategies at universities in Austria, Germany and the US. He began his career in Vienna where he studied computer linguistics, worked at the Cinémathèque Française in Paris and as a fashion photographer. In his speech, which is called “Emptiness: Energy from Within” he will show us that the energy from outside and the energy we have inside ourselves should not be seen as isolated units. On the contrary, they are directly connected and it is necessary to understand the whole picture in order to implement alternative energy forms. Dejan Štemberger is a Slovenian student and musician. He has been playing music since he is 15 years old, beginning with instruments like African drums, bongos and congas. After finishing school he decided to volunteer for the EVS (European Voluntary Service) and spent more than a year in Spain. In Spain he found a new instrument that immediately drew his attention. The “hang drum”, which is a special drum that is custom made and takes 120 hours of work. He has already played at several gallery openings, dance theatres, concerts and workshops for children. Dejan will be our musical component at TEDxKlagenfurt. 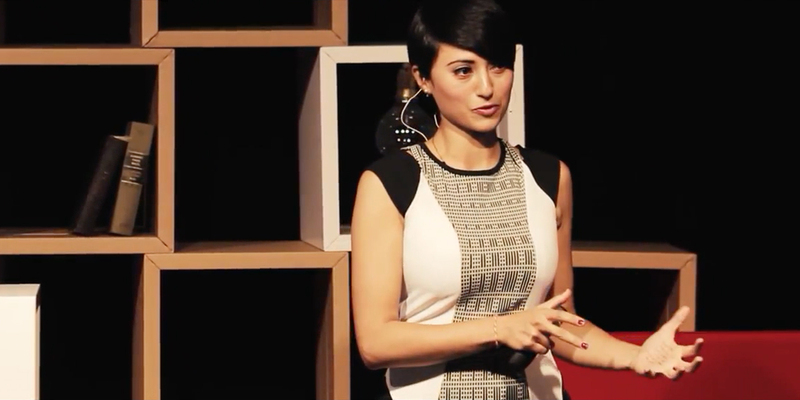 Tia Kansara is an award-winning entrepreneur, consultant and sustainability specialist. Moreover, she is the founder and director of Kansara Hackney Ltd, which is a leading consulting firm that is specialised in sustainable lifestyle and design. She completed her first degree at the School of Oriental & African Studies in Economics and South Asian Studies and holds a Ph.D. from University College London. Furthermore, she is fluent in Gujarati, Japanese, Hindi, Urdu, Sanskrit, French, Arabic and English. During her career she has worked with several leading companies, institutions and organisations like for example “Bloomberg”, the “UK Prime Minister’s Policy Unit”, the “United Nations Conference on Trade and Development” or the “Club of Rome”. The topic of her speech will be “The future city as experiment“. In her speech she will show us how the future city might look like and give us examples of cities that managed it to exist in harsh environments through innovations concerning water and energy efficiency. Japec Jakopin is actually a cardiologist and has worked as researcher at the Medical School, University of Ljubljana, and the Clinical Centre of Ljubljana. In 1983 he decide to take a much more different career path and founded the J&J design office with his brother Jernej. The former, simple design office is today a design, engineering and tooling firm called Seaway. The company has designed, engineered and equipped more than 300 sail- and powerboats. Seaway is one of the world’s leading firms in this field of business, which has, moreover, been awarded with 59 “boat of the year” prices. In his TEDx speech he will show us a new and innovative hybrid-boat-concept, which could totally change the current yachting industry. Dr. Nadya Zhexembayeva is the Coca-Cola Chaired Professor of Sustainable Development at IEDC- Bled School of Management, an executive education center based in Slovenia, where she teaches courses in leadership, organizational behavior, strategy, change management, design thinking, and sustainability. As a business owner, Nadya oversees a group of companies active in real estate, investment and consulting industries. Her recent client engagements include The Coca-Cola Company, ENRC Plc, Erste Bank, Henkel, Knauf, and Vienna Insurance Group. She also serves as Vice-President of Challenge:Future, a global student think tank and innovation competition. In her speech with the title “Overfished Ocean Strategy: Powering Up Innovation for a Resource-Deprived World” she will show us an alternative to our throwaway-economy, which has no future anymore. A new innovative idea, like this concept of a sustainable economic system is exactly what our resource-deprived world needs right now. Peter Piccottini is a successful industrial designer, consultant, professor at the University of Applied Sciences Carinthia and one of Austrians pioneers concerning “Bionics”. Moreover, he is founder and board member of several institutions and associations, like for example “bionikum : austria”, “BionikAustria”, “BIOKON international” and “Design Austria”. Energy, which is produced with fossil fuels or nuclear resources has damaged and polluted our ecological system. The world population is increasing tremendously and the emerging countries are developing fast. Because of that, more and more energy is needed and even more will be needed in future. The nature itself has always been showing us how to adapt to different circumstances and situations. The fairly new scientific discipline “Energy Bionics” tries to generate these solutions from nature itself. With his TEDxtalk Peter Piccottini will show us how “Energy Bionics” could be implemented and change the way we produce our energy. Christian Bauer has more than 25 years of experience in his field of business. The art director and creative consultant was, moreover, a pioneer and early entrepreneur for 3D technologies like 3D Online Communities, Virtual Reality and Web3D / VRML (Virtual Reality Modeling Language). Furthermore, he teaches at the University of Applied Sciences at the Institute for Renewable Energy. In his talk, which is titled “Towards a New Paradigm in Power Plant Construction” Christian Bauer will present us a totally new power plant concept that addresses the regular consumer. This concept could be a solution for our current problems concerning energy. Christian Bauer has more than 25 years of experience in his field of business. The art director and creative consultant was, moreover, a pioneer and early entrepreneur for 3D technologies like 3D Online Communities, Virtual Reality and Web3D / VRML. He has also been working many years in the field of elaborate cultural project management for the known Austrian artist André Heller. Peter Piccottini is a successful industrial designer, consultant, professor at the University of Applied Sciences Carinthia and one of Austrians pioneers concerning "Bionics". Dietmar Stuck has many years of experience as a well builder and has worked on projects in Africa, Australia and Europe. Years ago, he decided to specialise in sustainable development and invented the "NSP-new solar pump", which is a solar water pump that needs no complicated maintenance and no external energy connection. Nadya Zhexembayeva is the Coca-Cola Chaired Professor of Sustainable Development at IEDC- Bled School of Management, an executive education center based in Slovenia, where she teaches courses in leadership, organizational behavior, strategy, change management, design thinking, and sustainability. Who does energy belong to anyway? Jesse Marsh is an international consultant that has already worked on more than 35 EU Projects, involving organisations like for example the "Club of Rome". He has specialised in local development, strategic planning and innovation. TEDxKlagenfurt 2013 took place at the castle Maria Loretto on lake Wörthersee in Klagenfurt. The old historical castle at the lakeside linked with inspiring talks will spread the TEDx spirit and open people’s mindsets. The lake Wörthersee was recently chosen as a place you have to see before you die and is an amazing place to calm down and enjoy the nature. Despite careful checks we assume no liability for the content of external links. The operators of these sites are solely responsible for their content. Copyright: The operators of these sites try to always respect the copyright of others or to use either their own or license free works. The content and works that have been prepared by the operators of these sites are subject to Austrian copyright. Contributions from third parties are marked as such. Audio and image recordings will be made at our events. By participating in these events, you agree that such recordings may be made of you while in attendance and that these recordings may be used in all known media channel (TV, online, print, etc.) for an unlimited scope and time frame.